Wrapping up almost eight months that saw the three-day Seminar for Successors take place in 30 sessions in Japan and its overseas version at 20 venues in 18 countries and regions, its last Japanese session concluded on April 13 with participants making a fresh start on the journey toward spiritual maturity. 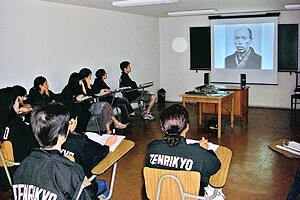 Intended for followers between the ages of 20 and 40, the seminar presented lectures and videos designed to help participants deepen their understanding of the basic teachings and learn more about the journeys taken by early followers who sought to follow Oyasama’s Divine Model. In addition, group discussions enabled them to reflect on their own faith as they talked frankly about living their lives based on the teachings. In Japan, the total attendance was over 23,000 men and women, roughly the same number as during the previous round, which took place 10 years ago. This includes 110 people from overseas, such as students currently studying in Japan, who attended by taking advantage of simultaneous interpretation offered in seven languages. The Overseas Seminar for Successors–held in such countries and regions as the United States, the United Kingdom, Australia, Nepal, the Philippines, Singapore, Brazil, South Korea, and Taiwan–drew a total of more than 1,200 people, which represents an increase of about 10% compared with 10 years ago. The Shinbashira delivered an address in the Foundress’ Hall at the conclusion of each session held in the Home of the Parent. He stressed the importance of being free from doubt about the path of the Divine Model of Oyasama and trying to implement it faithfully. “I hope that you will make a real effort to follow the path to the Joyous Life as shown by Oyasama. Without becoming too impatient or giving up, please keep trying day after day to follow the straight course of the Divine Model to make sure you yourselves can live the Joyous Life to begin with,” he said. Each session was supported by about 400 staff members. Those who served as lecturers during the 30 sessions totaled 136.